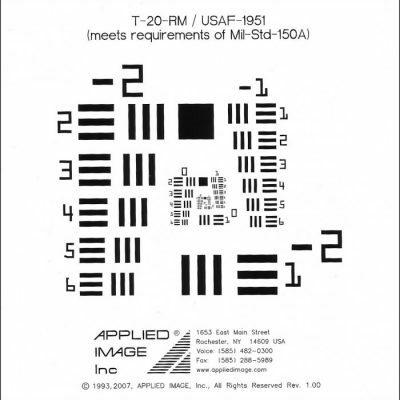 These targets conform to MIL-STD-150A. Frequencies change by the 6th root of 2. This target is also available in custom sizes and contrasts. 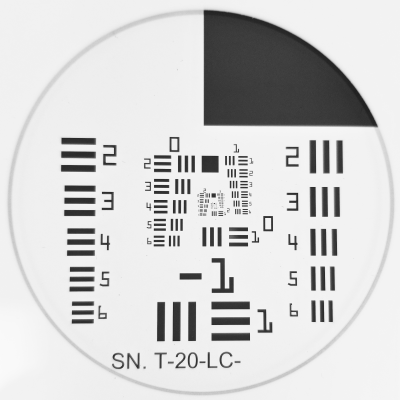 This test target meets requirements as specified in MIL-STD-150A for resolving power tests. The target consists of a series of Elements having two sets of lines at right angles. Each set of lines consists of three lines separated by spaces equal to the line width. Each bar has a length to width ratio of 5:1. (Line width is equal to one half of line pitch, which is the inverse of line frequency.) Elements are arranged in groups of six each and Groups are arranged in pairs. Even numbered Groups occupy the left side and bottom right corner and contain a square feature having and edge length equal to the line length of Element 2 in that group. Odd numbered Groups occupy the top right corner and side. Groups and Elements are labeled and differentiated by numbering adjacent to their features. Frequencies in cycles/mm (c/mm) increase between each Element by the sixth root of two (approximately 12.25% per step). The general formula for the line frequency of any target Element can be expressed as 2Group+(Element-1)/6. Notes: A popular choice for evaluation of visual resolution, imaging materials or optical systems. 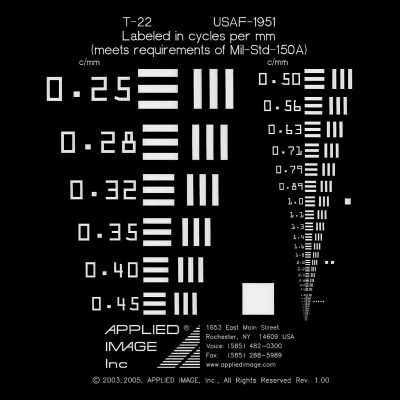 APPLIED IMAGE offers two improved versions of this test target as T-21 and T-22. 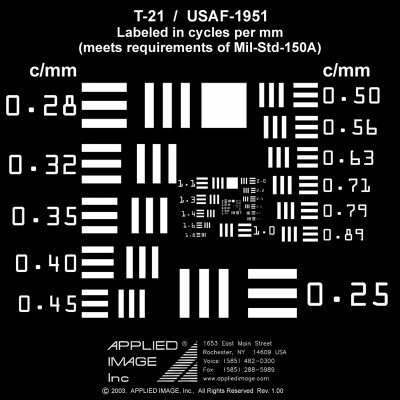 These are labeled directly in c/mm to obsolete the frequency look-up chart as well as other indicator and layout improvements.